NEW YORK — Faced with unprecedented change in customer behavior and expectations and the growing challenge of e-commerce, retailers across channels are testing new formats and fine-tuning existing store models. The innovation is being driven by a number of different factors, including the hope of luring emerging customer segments, the desire to penetrate new geographic markets, and the need to grow customer traffic and same-store sales. What all of the initiatives share is the goal of providing a compelling customer ­experience. Both of the leading drug store chains, CVS Pharmacy and Walgreens, have developed or piloted new prototypes within the last two years. CVS debuted its latest design last April, an approach that combines an expanded assortment and greater emphasis on healthier food and health-related products with enlarged and enhanced beauty departments. The CVS design employs a streamlined layout with “discovery zones” that offer holistic solutions for emerging areas such as sleep/mood, immunity and connected health. Informational signage helps customers find solutions and new offerings more ­easily. The health-focused format initially incorporated 100 feet of new merchandise in health and beauty aids and healthier food, including an expanded array of vitamins, supplements and nutrition products. CVS acknowledges that the catalyst for reimagining its store experience was the 2014 decision to stop selling tobacco products. Pulling those products created an opportunity to expand offerings in such areas as healthier food and beauty and to draw customers’ attention to them with an updated design and layout. 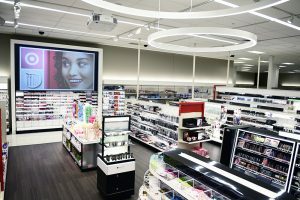 Like its chief rival, CVS has also upgraded its beauty care departments with an eye toward a differentiated experience through new offerings, including trendy new brands and an exclusive Korean Beauty section, new fixtures and the creation of discovery zones. While most of the changes in the new design are in the front-end departments, the evolution of CVS’ store format is ultimately geared to the creation of community health hubs that can provide high-quality, lower-cost health care in local settings. In the future, CVS Pharmacy locations will include space for clinical services, vision and hearing centers and medical equipment — in addition to the pharmacy and front-end offerings now available. CVS’ flagship store in New York City’s Times Square may provide a glimpse of the future for the entire store ­network. Through the pending acquisition of Aetna Inc., CVS executives say they will be able to lower overall health care costs by channeling more patients to the next-stage CVS Pharmacy outlets and thereby reduce the number of emergency room visits and hospital admissions. Supplemented by the use of health data and advanced analytics, the CVS of the future promises to lower health care costs by reducing the number of emergency room visits and hospital readmissions and by improving patient adherence to medication regimens. Ever since the 2016 acquisition of Alliance Boots GmbH and the creation of Walgreens Boots Alliance (WBA), the new leadership of Walgreens has focused on overhauling the chain, and the Walgreens drug store in particular. An early focus of change was the beauty department, which — like that of CVS — has become a point of differentiation, in part through exclusive brands brought in from Boots the Chemist, the leading drug chain in the United ­Kingdom. But the company has also developed a new concept, which it calls Beauty Differentiation, that features not only new brands but also a higher level of service with unbiased beauty consultants and new graphics, fixtures and lighting. Thus far, the stores incorporating Beauty Differentiation departments are outperforming the rest of the chain, according to ­management. Since this spring, Walgreens has been piloting a new format, new services and new approaches to assortment, pricing and promotions at 17 stores in the Gainesville, Fla., market. Like the CVS effort, the goal of the Gainesville pilot is to create a new experience for customers and patients. One aspect of the Gainesville program consists of a number of partnerships, including collaboration with Sprint to create Sprint Express stores within a number of the Walgreens pilot locations. In addition, Walgreens has expanded an existing pilot with LabCorp to several of its Florida stores, including four in Gainesville. Located near the pharmacy, the service centers, cobranded LabCorp at Walgreens, enable customers to provide specimens for lab testing in a secure and comfortable environment. According to WBA co-chief operating officer Alex Gourlay, the test centers are performing well. Another pilot that could significantly modify the Walgreens store configuration is a trial of full primary care in-store clinics in partnership with Humana, Inc. These sections complement the walk-in clinics already in operation in Walgreens stores, and specifically target Medicare patients. If rolled out throughout the Walgreens network, the evolution of the Walgreens drug store would begin to resemble the health hub concept of CVS Pharmacy. The first national drug chain to plunge into new format development, of course, was Rite Aid Corp., which piloted and began rolling out its Wellness store format a few years ago. As it has retrofitted the new design and layout through remodels, Rite Aid has found that its Wellness stores outperform the chain as a whole. A focus on health and expanded health services is thus a major feature of the format development programs at all of the three largest drug store chains. But it has also been adopted by a number of grocery chains that are seeking to attract health-conscious shoppers. Most recently, Hy-Vee Inc. opened its first HealthMarket store in West Des Moines, Iowa. The chain describes it as a concept store designed to be a one-stop shop for consumers who are seeking a healthier, more natural lifestyle. At just 15,700 square feet, the HealthMarket is far smaller than Hy-Vee’s main prototype supermarket, but it contains an impressive suite of health-related services, including a pharmacy, a walk-in clinic, in-store nutritionists and a hearing aid department operated by Lucid Hearing. The store’s product assortment includes a sports nutrition department and a range of probiotic and homeopathic items in addition to organic fruits and vegetables, fresh prepared food and meal solutions. In addition, customers can walk directly from the store into a fitness studio operated by Orange­theory Fitness, a provider of group personal training and fitness with whom Hy-Vee is partnering. Moreover, to supplement the 11,000-SKU assortment of the store, customers can pick up groceries ordered from Hy-Vee’s e-commerce site, Aisles Online, at a pickup destination next door. Hy-Vee plans to test two more HealthMarkets and may eventually open several more depending on customer response. “A lot of customers today can live out of this store,” observed Randy Edeker, Hy-Vee’s chairman and chief executive officer. While Hy-Vee went to the drawing board to develop its first HealthMarket, Publix Super Markets Inc. recently dusted off a concept it created several years ago with the health-conscious shopper in mind. The company debuted its first GreenWise Market, a specialty natural and organic food store, in Palm Beach Gardens, Fla., in 2007, followed by openings in Boca Raton and Tampa, Fla. Further rollouts stalled for a while. But now, at least four additional stores are planned, with the first slated to open in Tallahassee in October. Additional openings are set for Publix’s hometown of Lakeland, Fla.; Boca Raton, Fla.; and Mount Pleasant, S.C., and Atlanta-area media outlets are predicting that a GreenWise Market will open in Cobb County as well. On a different, more indulgent note, Albertsons Cos. is taking an unabashedly foodie-focused approach with its new Market Street Idaho format, which promises “exclusive culinary delights and unique dishes” that encourage customers to “hone their inner chef” through in-store culinary events and classes as well as the inspiration of an in-store restaurant-style food court and a catering service. To some degree, the development of alternative formats by supermarket operators is a defensive response to a recognized long-term trend: the decline of the traditional supermarket. According to “2017: The Future of Food Retailing,” a study by the consulting firm Willard Bishop, the number of traditional supermarkets will decline by nearly 25% between 2016 and 2021, while the sales share of the format will decrease 3.5%. The store count for fresh format grocery, which the report defines as emphasizing perishables and offering center-store assortments featuring ethnic, natural and organic and other distinctive categories, is projected to soar 48%. Limited-assortment grocers such as Aldi and Lidl are predicted to expand their store footprint by 21%. The revival of many urban centers in recent years has also led some big-box retailers to develop formats geared specifically to the special needs of city residents and to the constraints of urban real estate. Target Corp., for example, is devoting most of its investment in about 30 new stores this year to smaller models in urban and densely populated suburban neighborhoods and college campuses. Meijer Inc., a pioneer of the supercenter concept, recently debuted its own smaller format, measuring about 37,000 square feet, in its hometown of Grand Rapids, Mich. Five more are slated to open by 2021.